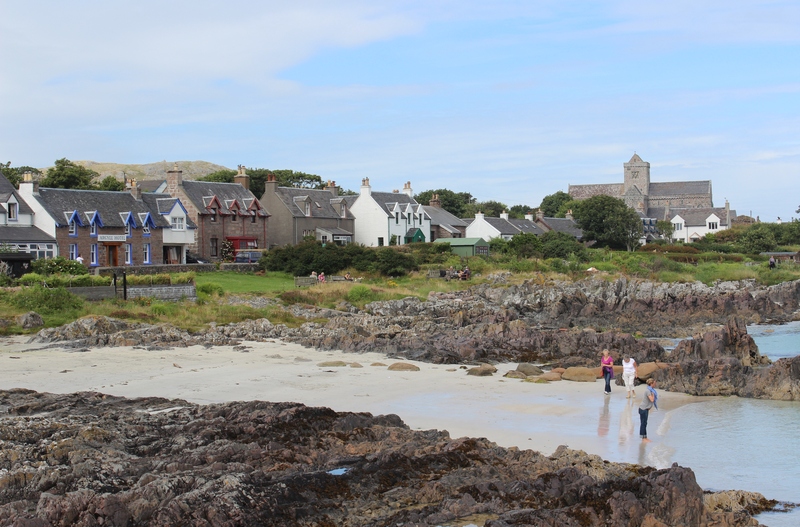 Today we took a boat from Mull to the even smaller island of Iona. Iona was a hopping center of Celtic Christianity back in the day. St. Columba arrived there with twelve of his Irish buddies in the year 503. He wasn’t a saint yet, but rather an exiled monk (back home he’d got into some trouble over a psalter that led to a nasty battle). But pretty soon he had a religious colony going. 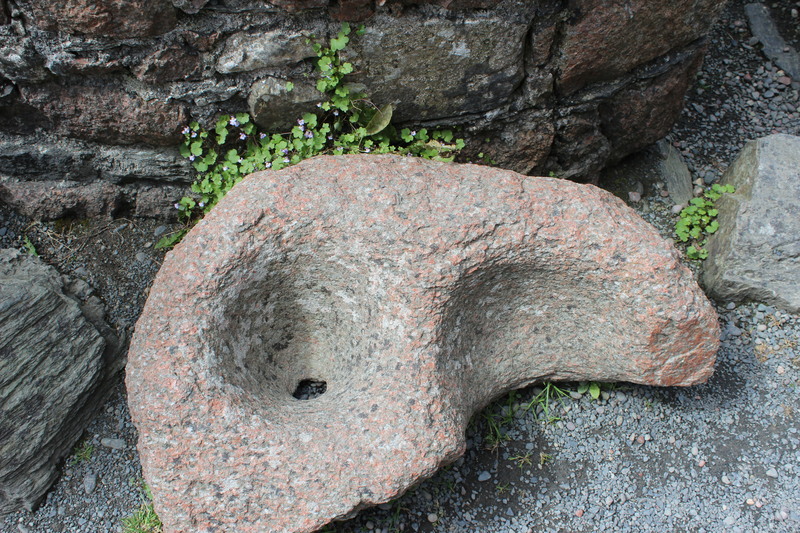 Columba founded an abbey on Iona. The monastery sent out missionaries who succeeded in converting the Picts of northern Scotland. After Columba died his shrine became an important pilgrimage site. The little building is the rebuilt Columba shrine; the shrine itself is no longer there. 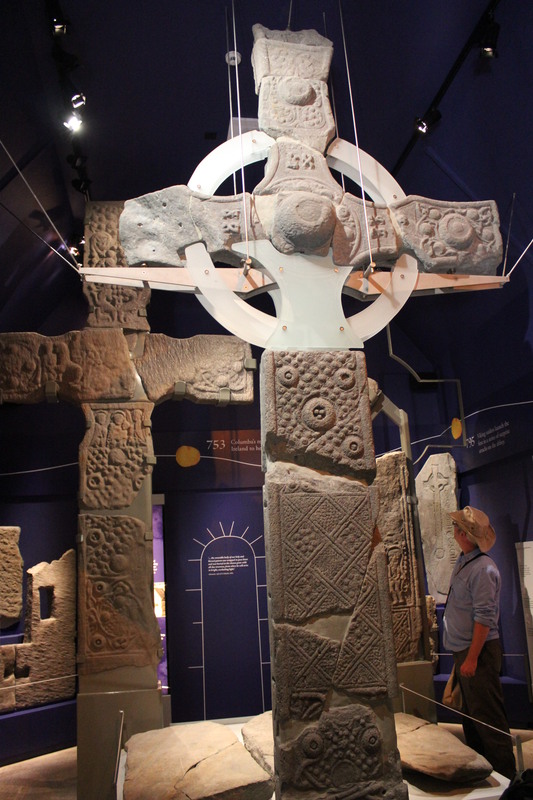 This picture (from an information board at the site) shows how the shadow of the St. John’s cross falls on the holy shrine… just like those neolithic monuments on Orkney and elsewhere. It’s still something of a pilgrimage site for the spiritually or historically inclined (we fall into the latter category). including illustrating the Book of Kells (whether on Iona or in Ireland is still debated… see the film The Secret of Kells for the Irish version of the story). Columba’s abbey has been rebuilt multiple times, but always on the same site. After 664 Iona wasn’t on the same page as the Roman branch of the church. While the rest of Britain went with Rome, in the 700s and 800s Iona was a thriving stronghold of the Celtic kind of Christianity. Things started to go into decline in the late 800s when Iona was subject to repeated Viking raids. That’s when the monks moved the book of Kells to Ireland to hide it from marauding Norsemen. By the end of the 1100s the Vikings were Christians themselves and ceased to be a problem to the Iona monks. In the 1200s the Benedictine monks came along and revitalized the place. They rebuilt the abbey and added a nunnery. Iona was important throughout Scotland. According to legend, 48 Scottish kings are buried in the reilig odran graveyard, including Macbeth (yes, that one) and the powerful lairds of the isles. This entry was posted in Elsewhere, Islands and tagged Iona, Macbeth, Scotland, St. Columba, United Kingdom. Bookmark the permalink.